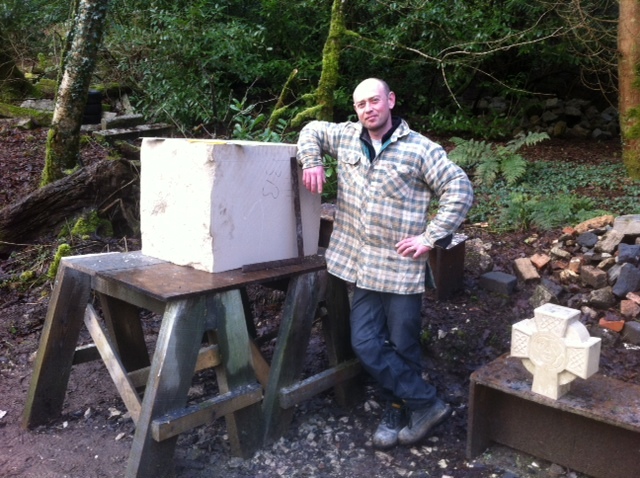 Pete went up to Portland in Dorset last week to collect a piece of stone that will become the lion carving. There’s a photo of the clay model for the lion on our facebook page. It will be quite a large piece, and is going to be on show at the Delamore Arts outdoor sculpture show in May. It was also a good opportunity to pick up numerous small pieces of Portland stone for students to work on. Many of Pete’s carvings are made from ‘found’ pieces of stone but this one requires bespoke material because of its size. A couple of years ago he made a dragon’s head out of a similar sized piece of Portland. We reckon the stone weighed about 400kg – shifting this from the van to the workshop area was a delicate operation!